EUGENE, Ore. — As a junior with the Oregon volleyball team, Willow Johnson is carving out her own path in the world of athletics. Still, at times Thursday night, it was hard not to be reminded she’s the daughter of Hall of Fame baseball player Randy Johnson. Particularly when Willow was firing left-handed serves at New Mexico State with the velocity of her father’s famous fastball, and the movement of his lethal slider. Johnson’s serve was a difference maker Thursday as the UO volleyball team beat the Aggies in four sets, 25-22, 18-25, 25-21, 25-11, before 2,407 fans in Matthew Knight Arena. 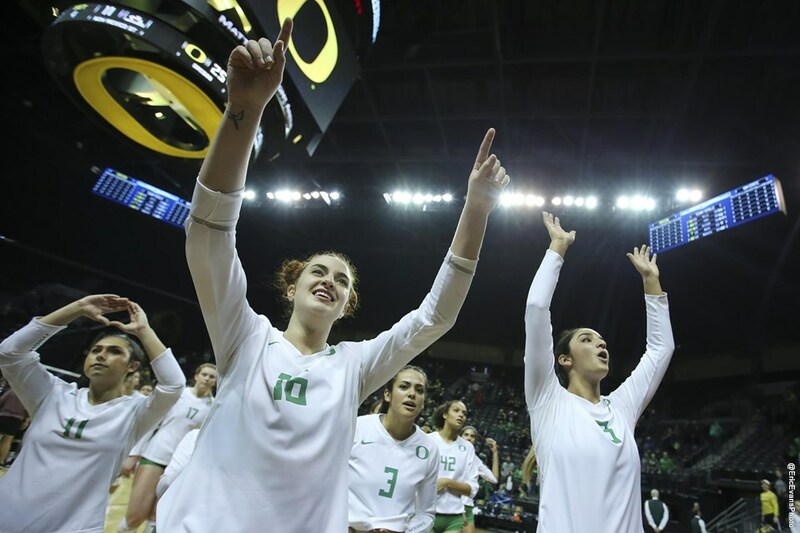 The Ducks (21-10) thus won their opening match in this year’s NCAA Tournament, and advanced to face Baylor on Friday (7 p.m., Pac-12 Network) for a spot in the Sweet Sixteen. Highlights from tonight's #NCAAVB first-round win over New Mexico State. New Mexico State had won the second set and was engaging the Ducks in a back-and-forth third set when Johnson first made her presence known. She took over serve with Oregon clinging to a 16-13 lead and served four straight points, including an ace. Johnson rotated out after that run and was greeted by an ovation from the hometown crowd. She got another in the fourth set, when she took over serve with the Ducks down 6-5 and didn’t give it up until Oregon led 15-6. Johnson’s four aces far surpassed her previous career high of one. She only began serving regularly this season in Oregon’s final match before the NCAA Tournament, because of the Ducks’ depth in the back row. Thus, there wasn’t much film of Johnson’s wicked serve for New Mexico State coach Mike Jordan to study. Which he brought up with Ulmer in the post-match handshake line. Johnson’s service skills were needed in part because junior Taylor Borup’s lingering ankle injury flared back up. Borup, who didn’t play in the final weekend of the regular season, had Oregon’s first kill of the night, and another during a three-point run to set up set point in the opening set. But her ankle began to nag her in the second set, and the Ducks missed her ability to cover ground in the back row. Lindsey Vander Weide had one of her match-high 18 kills to put Oregon up 14-13 in the second set, but New Mexico State then rattled off nine of the next 10 points in the set — including a couple of aces — on the way to squaring the match. The third set featured more of the same, as the Aggies gamely stayed within shouting distance. At least until Johnson took over serve, and put the Ducks firmly in control. After Johnson’s fourth-set serving put Oregon up 15-6, Vander Weide did much of the heavy lifting. She had a kill during a three-point run to an 18-7 lead, another as the Ducks scored five straight to lead 23-8, and then the final kill of the night to end the match. That was kill No. 18 for Vander Weide, on a night she hit .447 and added 10 digs. The senior seemed energized by finally having the chance to play a postseason match at home, for the first time in her career. Come Friday, she’ll look to do something else for the first time in her four years at Oregon — get past the first weekend of tournament play. EUGENE, Ore. – New Mexico State volleyball took on No. 15-seeded Oregon at Matthew Knight Arena as a part of the first round for the NCAA Tournament on Thursday. Despite taking a set from the Ducks, the Aggies fell 22-25, 25-18, 21-25, 11-25 ending the team’s postseason run. NM State (24-8) came out hot to start the match and following a kill by Savannah Davison, UO (21-10) called a timeout with the Aggies leading 9-4. However, New Mexico State’s advantage dwindled following a four-point run by the Ducks and after allowing a service ace, Jordan used a timeout with NM State trailing 15-13. A kill by Brigette Lowe snapped the rally for Oregon but the Aggies continued to trail by a pair. NM State continued to fall behind but a kill out of the middle by Julianna Salanoa got the team within three. Despite allowing the Ducks to reach set point, the Aggies posted a four-point rally before a service error handed NM State the 25-22 loss in the opening set. New Mexico State went back-and-forth and three-straight kills by Tatyana Battle tied the second set 13-13. Not backing down, Briana Ainsworth went to Davison on the outside and the kill by the redshirt freshman sent the Aggies into the media timeout with a one-point advantage. New Mexico State continued to fight and after back-to-back aces by Battle, the Ducks looked to stall the Aggie offense as the Crimson and White led 18-14. Another ace came from Battle and following an Ashley Anselmo kill, the Oregon used another timeout with New Mexico State ahead by six. The Aggies continued to dominate late and Davison put the 25-18 victory away with a kill off a Natalie Mikels assist. NM State looked to carry its momentum from the second set but at the media timeout, the Aggies were behind by four. A kill by Brigette Lowe brought New Mexico State within a pair at 15-13 but an ace by the opposition put the team behind by five, forcing the Aggies to use a timeout. With Halle Razo serving, NM State clawed within three with help from back-to-back kills by Battle, New Mexico State trailed 21-18. The deficit proved to be too much to overcome and the Aggies fell 25-21 in the third set. New Mexico State fell behind early in the fourth set after allowing the Ducks to post a four-point run that left the Crimson and White behind 8-6. After Jordan used a timeout to stop the hot Oregon offense. The Aggies allowed five-straight before calling for their last timeout of the set. A kill by Anselmo ended the UO run but the team remained behind by eight. The deficit grew to 10 late in the set and UO was too much for NM State and the team fell 25-11. The Aggies posted 54 kills and a .207 hitting clip for the match while holding Oregon to 50 kills. Salanoa led the team with a career-high 15 kills. Battle closed her senior season with 14 kills on hitting .400. Davison ended her freshman campaign with a double-double that included 11 kills and 10 digs. Defensively Razo led the way with a match-best 16 digs. NM State’s season ends following the squad’s NCAA tournament appearance. Seniors Battle and Ainsworth leave the program with their names etched in the New Mexico State record books. Battle leaves a legacy being third in career total attempts (3,999) and fourth in kills (1,386) while Ainsworth sits in fourth for career assists (2,769).